Our digital fingerprints are everywhere. But with trillions of digital events occurring each day, the challenge is separating the narrative from the noise. Only iDS has the expertise, experience, and technology to turn that data into an edge in litigation. 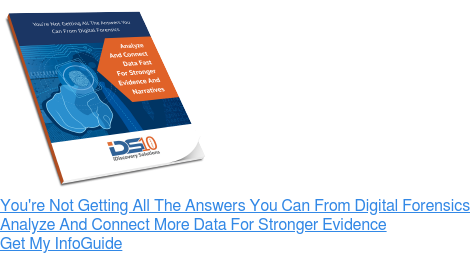 From digital forensics to expert testimony, our eDiscovery services span the entire EDRM cycle and help you take command of the data, control the narrative, and conquer the case. Tailored to your needs, we address your legal obligations, including data identification and preservation, collection, processing, review, and production requirements. From planning to execution, we use our deep expertise and experience to provide recommendations and solutions that accelerate review, reduce cost, and mitigate risk. Our designation as 30(b)(6) witnesses, subject matter experts, and opinion experts gives us the unique ability to provide advantageous consulting solutions and expert testimony. Data is more than email and texts. From GPS and smart appliances to fitness trackers and voice-enabled devices, there’s a world of information available if you have the means to capture, analyze, and connect it. Always at the forefront of innovation, iDS is the first eDiscovery firm to leverage the xIOT platform, a cutting-edge data aggregation and visualization technology. Powered by the xIOT platform, we have the ability to quickly turn disparate data into day-in-the-life reports and persuasive narratives. The term expert gets used by many but applies to few. Operating at the intersection of law and technology, our team of computer technologists, data scientists, and former litigators has court-recognized expertise. That status not only gives us the unique ability to provide expert testimony in electronic systems, information, and discovery, but it also allows us to best apply technology and the law to your advantage.